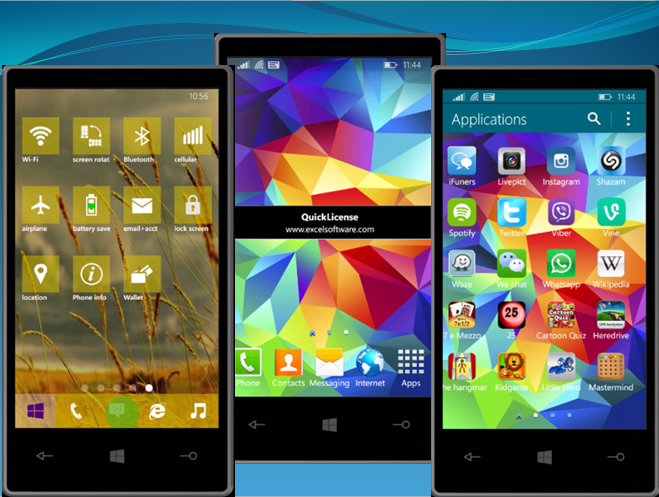 There are two apps that are available (Super 8 and Galaxy S5+) to Change the UI of a Windows phone into Android Phone. Galaxy S5+ App turns your Windows UI into Samsung S5 like UI. Please Note : This won’t install Android OS or Change anything in your Windows phone other than Changing the basic Windows UI to Android UI. Plans 2.handy tools messaging,IE browser, flashlight, stop music, music timer, calendar, alarm, stopwatch, countdown, write email, phone info, wallet 3.settings: Wi-Fi, screen rotation, battery saver, Bluetooth, cellular, airplane mode, email+account, lock screen, location. The Galaxy S5+ is much more than a simple Android emulator, it’s a world of applications, games and social! You can have fun with more than 85 icons. All you have to do is to register yourself and start enjoy this wonderful app! Protect access to Galaxy S5+ with the new PASSWORD feature. you can set your PASSWORD in settings area! Personalize your Galaxy S5+ background selecting from hundreds of wonderful pictures. To Know more Watch the Videos. Watch Galaxy S5+ in action in the Video below on How to convert Windows Phone to Android. Just wanted to let you know that We’ve launched YouTube Channel where we upload awesome video content. Make sure you hit the subscribe button to stay up to date with the new videos we upload every week. This was all about on How to convert Windows Phone to Android and to watch more Video Tutorials Please visit our Youtube Channel and Subscribe us.